I was inspired by a very sweet and talented fellow card maker, Lisa, to use up some of my scraps, after seeing one of her adorable cards! I just so happened to have the same bitty scraps sitting around and thought it would be fun to give them a whirl! So today's card is an eclectic mix of little odds-and-ends. To start this card, I used a lovely Prima stamp called Offset Dots to stamp the background in a soft shade of blue, French Ultramarine from Ranger Archival Ink. 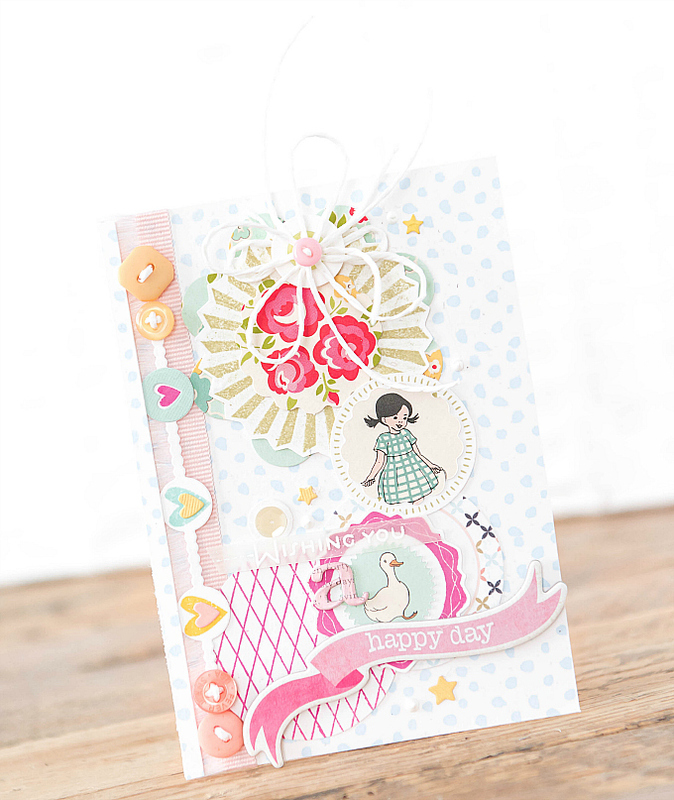 On the side of the card, I added a wispy pink ribbon, with a Confetti Garland die-cut from Papertrey Ink. To embelish the garland, I used buttons, heart stamps from Love Lives Here, and bitty confetti hearts from Neat and Tangled Little Bits dies. I added a large focal point at the top of the card, by layering all the little bits and pieces I had scattered about my scrap bin. 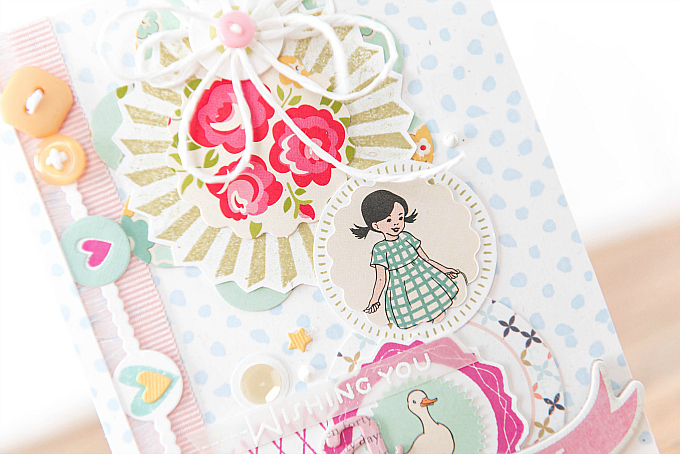 Some of the pieces feature vintage flowers and sweet images, while others are leftovers from previous stamped projects. Since I had so many of these little bits, I thought I'd use them all up to create a cascading look to the card. 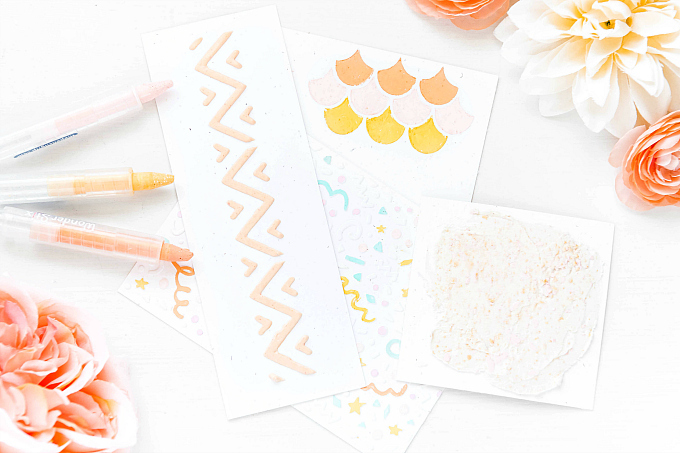 For the stamped pieces, I used colors of Spring Moss, Raspberry Fizz, Harvest Gold and Aqua Mist ink from PTI. I scattered a few little stars and sequins about the card, and added a few mis-matched pieces together for a sweet sentiment. It's always a pleasure cleaning out scap bin. Thanks, Lisa, for the inspiration :) And thank you all for visiting! Leftovers are quite fun, aren't they! Thanks for visiting dear friend :) I hope you are doing well! Lots of hugs right back atcha! Thank you so much for the sweet shout out! Your card is absolutely delightful. 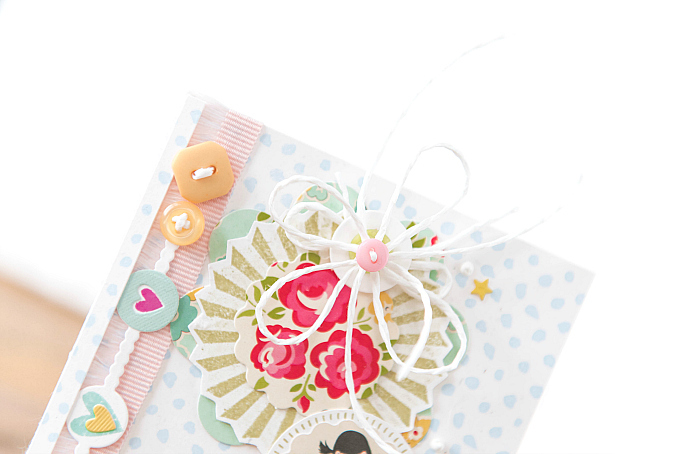 I spy some October Afternoon scraps on your card too. This is extra sweet Ivana!